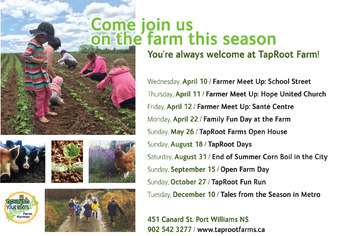 Celebrate the Easter long weekend with TapRoot Farms. Everyone is welcome to come and spend the day on the farm. Walk on the trails, say hello to the animals and see what's happening in the tunnels. Explore the farm in true Easter style. We will be hosting a scavenger hunt with 10 stations set up around the farm, each station there will be riddles or activities to complete. There will be prizes for participants after the hunt! Please wear clothing you don't mind getting muddy, and a good pair of rubber boots, the farm is a muddy place in the Spring! There will be snacks provided but please BYO picnic lunch. We have a covered area and picnic tables to use. If you would like to participate in the activities (scavenger hunt) we are asking for a pay what you can donation. After the festivities we will be hosting our first Community Garden meeting. This is the first year of our community garden. We have 20 garden plots available at our 1736 Church Street location. Our plots are 6 ft x 25 ft. This land is certified organic land, so all of the seeds, inputs and management strategies must be approved for organic production. We are happy to provide you with everything you will need to successfully grow your garden. Feel free to come spend the day with us. Or pop in and out as you please.